Researchers from the Australian National University (ANU) are confident they have found direct proof, for the first time, that the Earth’s inner core is solid—albeit a little bit squishy. In a paper published in the journal Science, Hrvoje Tkalčić and Than-Son Phạm both at ANU describe how they detected so-called "shear waves" in the inner core. These are a type of wave propagated by earthquakes that travel through the Earth’s interior and can only move in solid material. Shear waves travelling through the inner core are thought to be so weak that they can't be observed directly. In fact, detecting them has been considered the “Holy Grail” of global seismology since scientists first predicted the center of the Earth was solid in the 1930s and 1940s. To find these waves, the researchers used a global network of pairs of receivers which measure activity in the Earth's interior. After major earthquakes, the team measured the similarity of the observed signal collected by thousands of receiver pairs in order to construct a global correlogram—a kind of “fingerprint” of the Earth. The results contained evidence of of shear waves in the inner core and indicated the speed that they were travelling at. The first indirect proof that the inner core is solid came in the 1970s, after a paper published by Adam Dziewonski and Freeman Gilbert. However, PKJKP wave observations in the inner core would be more direct proof—the “Holy Grail” that seismologists have been searching for. The new work has important implications for how we investigate the Earth’s interior, and indeed those of other planets, according to the authors. “We have unleashed the potential of a relatively new method that has been on the rise for the last decade or so, and we have shown how the method can revolutionize global seismology and future studies of other planets," Tkalčić said. Despite the new insights, there is much that remains a mystery about the center of the Earth. 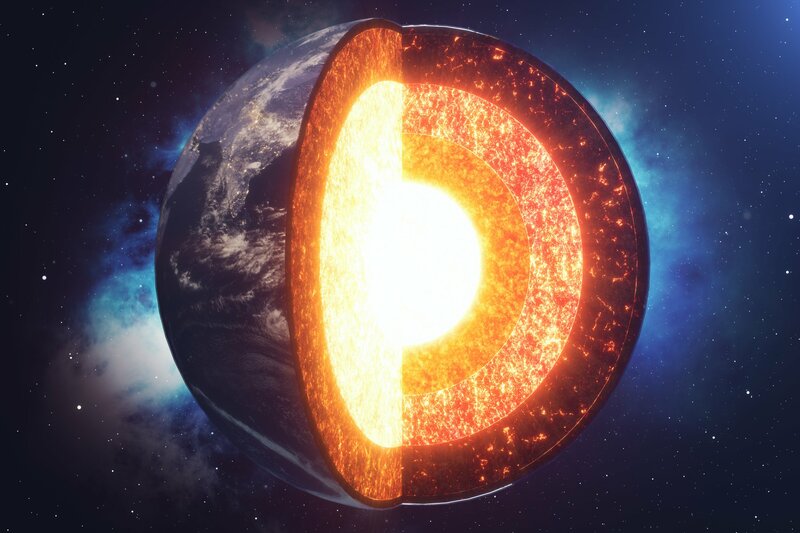 “For instance, we don’t know yet what the exact temperature of the inner core is, what the age of the inner core is, or how quickly it solidifies, but with these new advances in global seismology, we are slowly getting there,” Tkalčić said. “The understanding of the Earth’s inner core has direct consequences for the generation and maintenance of the geomagnetic field. Without that geomagnetic field there would be no life on the Earth’s surface,” he said. This article has been updated to include additional comments from Hrvoje Tkalčić.